The Inglenook vineyards have one of the longest, and most interesting stories of any of the founding vineyards in the Napa Valley region. The original estate was created in 1873 by William C. Watson, Watson was an officer of the Bank of Napa. William C Watson was already interested in wine due to his being the son in law of George C Yount. Watson named the property Inglenook, which was an old Scottish term for a cozy corner. The original intention for William Watson was to create a resort with a small vineyard. William C Watson did not keep the estate for long. After cultivating 40 acres with vines, he sold the property. In 1879, Captain Gustave Niebaum purchased the Inglenook Vineyard. At time of the sale to Gustave Neibaum, the estate had 70 acres planted with vines. At the same time, Gustave Niebaum also obtained the neighboring 440 acre property belonging to the Rohlwing family. In total, to create his dream estate, Gustave Niebaum spent close to $50,000, which is a massive sum of money in those days! Gustave Niebaum graduated from Helsingfors Nautical Institute. He was Captain of his first ship by the time he was only 21 years old. It was during his travels to the San Francisco area that he became interested in the wine business. It took 4 years of work after buying the land, but by 1882, he began construction of the main house that is still in use today and Inglenook Vineyards. 1882 was a big year for Neibaum as he purchased 712 additional acres of vines, expanding the estate to more than 1,200 acres of land! The next major addition to the property was to dig and create a series of underground caves for the aging process, mimicking how the wines of Bordeaux were being aged. Even though Gustave Niebaum did not have an official residence built yet, his first 4 years as the owner of Inglenook Vineyards were spent replanting the estate. He removed the remaining Mission grape varieties from the vineyards, replacing them with Burger, Gutdel, Riesling, Burger, Traminer and most importantly, Cabernet Sauvignon! Construction of the mansion was completed in 1887. Inglenook Vineyards won a gold medal at the 1889 Paris Exposition for their wine. That notoriety made it possible to have their wines placed in all the First Class dining cars on the Canadian Pacific Railroad. The newfound wealth allowed Gustave Niebaum to continually increase the size of their vineyards so that by 1893, Inglenook had over 300 acres of vines. 50 acres of those vines were already planted to phylloxera resistant root stock. 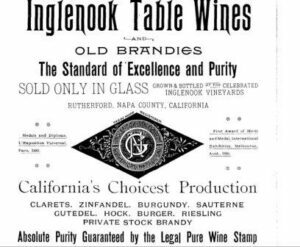 Inglenook by this time was producing a wide range of products including Zinfandel, Bordeaux blends, sweet, white wines, and other assorted varieties as well as Brandy. At its peak, at the turn of the century, Inglenook was producing close to 60,000 cases of wine each year! Inglenook was one of the first, if not the first California winery to bottle and sell their own wine, advertising a guarantee of authenticity. Gustave Niebaum died in 1908. For 3 years, Inglenook ceased production, going back into business in 1911. From that point forward, the estate was managed by his widow, Susan Niebaum until John Daniel came of age and took over the property. 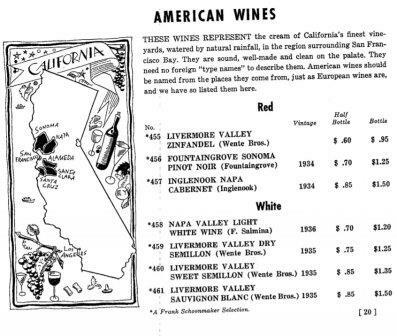 During Prohibition, Inglenook survived by selling grapes and grape by products. 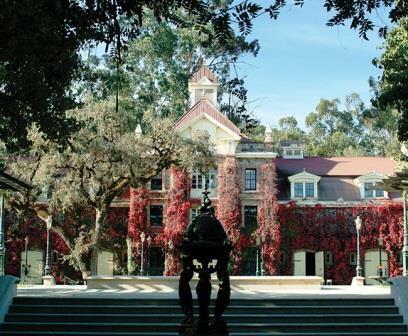 Following the repeal of Prohibition, Inglenook became one of the first California wineries to begin producing and bottling wines made from Cabernet Sauvignon. They started this by 1934, as you can see from this rare menu, printed back in 1940. John Daniel Jr. began taking control of Inglenook in 1939. The next accomplishment by John Daniel was when he purchased the vineyard, long known as Napanook in 1946. Perhaps the most interesting creation of the John Daniel Jr. era was the decision to mark specific, high quality barrels, giving them a special number. That cask number was printed on the label for the wine. The best of those wines are now legendary among, old wine collectors. Some of those bottles sell for thousands of dollars today! If you have a bottle, and need a friend to help you taste it, I am there for you! The numbered program successfully ran from 1940 to 1964. John Daniel Jr continued managing the vineyard until he sold the history property in 1964 to Allied Grape Growers. John Daniel Jr hung on to large parcels of land and the mansion. Heublein Incorporated purchased the majority of the stock of the Allied Grape Growers company in 1969, becoming the owner of Inglenook Vineyards. After John Daniel died in 1970, his widow sold most of their holdings. She retained the Napanook Vineyard, giving that to her daughters. They used that vineyard to form Dominus, with Christian Moueix. The Inglenook vineyards changed hands in 1975 when it was purchased by Francis Ford Coppola. Coppola bought everything but the famous, Inglenook name. Francois Ford Coppola earned his fortune as a Hollywood director, who has just made “The Godfather. At the time of the purchase the estate included 1,560 acres of land and the original, Gustave Niebaum mansion. It was at this time that the property was renamed, Niebaum-Coppola Estate Winery. Under its new owners, the Inglenook Niebaum-Coppola Estate Winery had their first official harvest with the 1978 vintage. In that year, they created their new, Proprietary Blend, Rubicon, which took the inspiration for its from the crossing of Julius Caesar over a river on one of his military campaigns, Even though Francois Ford Coppola loved Italian wines, Rubicon was made from a typical, Left Bank Bordeaux blend. Because Rubicon sees extended aging, the first vintage was released in 1985. 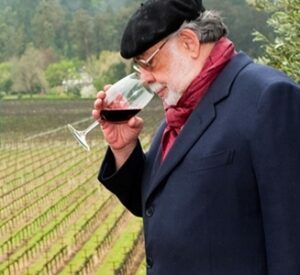 In 1997, Francis Ford Coppola expanded the vineyard when in purchased the JJ Cohn vineyard. He also managed to complete the restoration of the mansion that same year. In 2011, Francis Ford Coppola purchased something more important than land, he obtained the original naming rights of the estate, and from that day forward, changed the name back to Inglenook. At some point in time during this period, Francis Ford Coppola brought in Stephane Derenoncourt to consult on their Inglenook Rubicon wine. Continuing in the Bordeaux vein, Inglenook hired Philippe Bascaules, was was previous working at Chateaux Margaux as their General Manager. In late 2016, Philippe Bascaules returned to Chateau Margaux as the Director of the estate. However, Philippe Bascaules will continue as a consultant to Inglenook wines. Inglenook produces a wide range of red and white wines from the Napa Valley and Rutherford. Inglenook owns are 1,500 cases of land, whcih includes 2005 acres of vines. The best terroir owned by Inglenook is Rutherford Bench. The terroir has slopes, gravel, loam and clay soils. Inglenook has been 100% organic since 1975, although they were not certified until 2002. The majority of their vineyards are dry farmed. Inglenook Rubicon – Produced from 100% Cabernet Sauvignon from estate owned vines in the Rutherford appellation. The wine is aged for 18 months in 75% new, French oak barrels. The grapes are planted the Apple, Cohn, Cree, Garden Gio and Walnut vineyards. Inglenook Cabernet Sauvignon – Previously, this wine was sold under the name of Cask, Cabernet Sauvignon. You can consider it the second wine or Rubicon. The wine is produced from 87% Cabernet Sauvignon, 8% Cabernet Franc, 3% Petit Verdot and 2% Merlot. The wine is typically aged for 18 months in 90% French oak barrels and 10% American oak barrels that are on average 50% new and the remaining barrels are 1 year old. Inglenook Edizione Pennino Zinfandel comes from a blend of 94% Zinfandel 5% Primitivo and 1% Petite Sirah. Inglenook RC Reserve Syrah The wine is made using almost 100% Syrah with just a drop of 1% Petite Sirah and is aged in 50% new, French oak barrels. Inglenook, Sauvignon Blanc is made using only 100% Sauvignon Blanc. The wine is aged in stainless steel tanks. 2012 marked the debut for the wine when the estate grafted Sauvignon Blanc onto a small parcel of Petit Sirah. Inglenook Blanceaux is a white, Northern Rhone styled wine produced from a blend of 56% Viognier, 22% Roussanne and 22% Marsanne. Inglenook is best served at 15.5 degrees Celsius, 60 degrees Fahrenheit. The cool, almost cellar temperature gives the wine more freshness and lift. Young vintages can be decanted for 1-3 hours, depending on the character of the vintage. This allows the wine to soften and open its perfume. Older vintages might need very little decanting, just enough to remove the sediment. Inglenook is best served with all types of classic meat dishes, veal, pork, beef, lamb, duck, game, roast chicken, ribs, hamburgers, barbecue, roasted, braised, grilled dishes and stews. Inglenook is also good with Asian dishes, hearty fish courses like tuna, salmon, mushrooms and pasta. The white wine of Inglenook is best served with all types of seafood and shellfish, sushi, sashimi, chicken, veal, pork and cheese. Lush, rich, concentrated, forward, ripe and packed with fresh, sweet fruits, licorice, oak, smoke and black cherries. Drink it now or age, this is really nice and already open. For Napa Cabernet today, it's also really well priced. 95% Cabernet Sauvignon and 5% Petit Verdot create a wine filled with smoke oak, blackberry, coffee, fennel and black cherry. With soft tannins and plush textures, the wine ends with a vanilla tinged, blackberry finish. The wine will be aged in 80% new oak. From a blend of 88% Cabernet Sauvignon, 9% Cabernet Franc and 2% Merlot, the wine is medium bodied, bright, crisp and focused on the red berry side of the style range. 92% Cabernet Sauvignon, 4% Cabernet Franc, 3% Petit Verdot and 1% Merlot created a smoke, coffee, oak, licorice and jammy blackberry filled wine with good concentration of flavor, rich textures and a supple finish, ending with sweet, ripe, black cherries. Medium/full bodied, with a smoky, licorice, herb and black cherry nose. There is a touch if greenness in the .end note that takes away from the wine. This is a much better wine than it was when tasted as a barrel sample. It's really filled out with much more richness and fullness. The sweet, ripe blackberries, black cherries, licorice, chocolate, vanilla and smoke are out in full force. The tannins are ripe, round and polished. From one of the highest concentrations of Cabernet Sauvignon ever used in the blend at 98%, with the remainder coming from Caberent Franc, the wine opens with blackberry jam, earth, coffee, black cherry, fresh herbs and cassis in the nose. There is ample freshness, tannin, fruit and structure to age well. Utilizing 95% Cabernet Sauvignon and 5% Petit Verdot, this medium bodied wine is structured, firm and tannic, with a sweet and tart, red and black berry personality and finish. 87% Cabernet Sauvignon, 6% Cabernet Franc, 4% Petit Verdot and 3% Merlot open to a light ruby colored, medium bodied wine with a bright, cassis, coffee bean and plum finish. Fully ready to go, this medium bodied, round, soft, lush textured wine loads your glass up with a smoky, dark cherry, licorice character that is clearly in its prime time, drinking window. This fully mature Cabernet Sauvignon tasted at least 20 years younger! Tobacco, cedar, cassis, cherry, earth and cigar box, medium bodied, refined textures and enough concentration of flavor to keep interesting. The wine ended with cassis and cranberry.